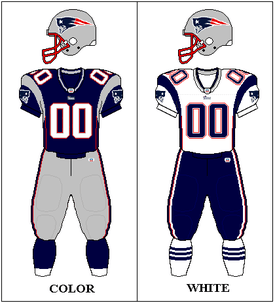 The 2002 New England Patriots season was the 33rd season for the team in the National Football League and 43rd season overall. They finished with a 9–7 record, good enough for second in the division but not a playoff berth. Following their victory in Super Bowl XXXVI seven months earlier, the Patriots played their first game in the new Gillette Stadium in the NFL's prime-time Monday Night Football opener against the Pittsburgh Steelers, a win for the Patriots. After an additional two wins to begin the season, including a 44–7 road win against the division rival New York Jets, the team lost five of its next seven games, allowing an average of 137 rushing yards a game during that span. In the final week of the season, the Patriots defeated the Miami Dolphins on an overtime Adam Vinatieri field goal to give both teams a 9–7 record. A few hours later, the Jets, who defeated the Patriots the week prior, also finished with a 9–7 record with a win over the Green Bay Packers. Due to their record against common opponents, the Jets won the tiebreaker for the division title, which eliminated the Patriots and Dolphins from the playoffs. As of 2015 this is the last season the Patriots failed to win 10 games. Of note this was commentator John Madden's first regular season game that did not feature an NFC team. He had worked at CBS and Fox for the NFC package from 1979–2001, and moved to MNF on ABC this season. ABC's games featured teams regardless of conference affiliation. ↑ "New Stadium Has Face Value". Hartford Currant. August 6, 2002. Retrieved June 28, 2015. ↑ "New England 27, Miami 24, OT". Yahoo! Sports. December 29, 2002. Retrieved January 28, 2008. ↑ The Patriots traded their first-, third-, and seventh-round draft picks to the Washington Redskins for the Redskins' first-round pick. Patriots.com summary.